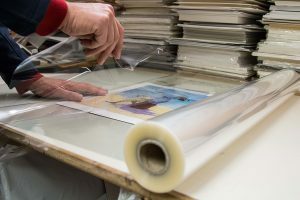 Our Crystal Clear Wrapping Film is made from 40 micron polypropylene and used to protect and wrap all kinds of prints and mounted artwork whilst giving a neat and professional finish. There are no minimum order quantities on this product and we keep stocks in three different sizes allowing a next day delivery service on this product. We can also offer bespoke widths on this product meaning you can have any width roll between 100mm and 1200mm x 120m.